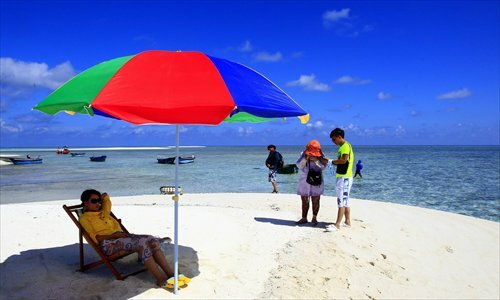 Since 2013, around 10,000 Chinese tourists have been able to enjoy the natural beauty of the Xisha Islands in the South China Sea. As part of its plan to develop the islands, the Chinese government is promoting tourism to the region, in addition to building transport infrastructure, despite Vietnam also claiming the islands. Yan Lizhu immediately started planning her trip to the Xisha Islands in the South China Sea after the Chinese government's 2013 announcement that they were opening the region to tourism. "We've known about the Xisha Islands for many years, ever since the Vietnam War. At that time it seemed remote and unreachable, but now these islands are open to the public and we felt we had to go," she said. Yan is a retired woman in her 50s. She eventually went to the islands in October last year and has since told all her friends about them. Since they were opened up, media reported that more than 10,000 tourists have already been to the islands. On the first day of her trip, Yan was nearly moved to tears. The boat took her to Yinyu Island, and she attended a flag-raising ceremony with the rest of the crew, hosted by staff stationed there. The sound of the Chinese national anthem against the ocean wind echoed over the white-sand beach, and the crowd broke into cheers. "Everybody swore 'I love our country, I love Xisha,'" she said. "We felt a sense of pride. The Xisha Islands were so beautiful; we couldn't give this place up." The sense of patriotism stayed all through her four-day journey. One evening, a movie made in the 1970s about people who live on the Xisha Islands was screened. After being taught about the Xisha Islands from a young age, Yan felt genuinely excited to set her foot on the tiny isles. "We also know that China and Vietnam fought a war over the islands in 1974, and now we have fishermen living on these isles, there's even a residential committee, it must be the smallest in the country," she said. 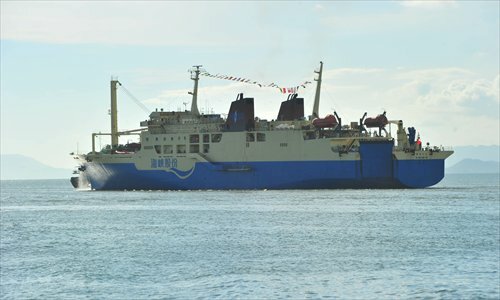 There was only one boat that Chinese tourists can take to the region, and it is literally called the Coconut-fragrance Princess, or Yexiang Gongzhu. The boat retired this year and was replaced by a slightly larger one. They can only go sightseeing on three islands that are at the southern end of the archipelago - Yinyu, Yagong and Yongfu. The boat can carry about 200 tourists and leaves from Sanya, South China's island Hainan Province and sails through the night to the islands. The tour does not take travelers to Yongxing Island, where the administrative center of the islands was established in 2012, or Qilian Yu, which has recently been a hotspot of infrastructure construction. The passengers can take yachts to the three open islands, two of which are occupied by fishermen. The islands are all fairly small, about 0.01 or 0.02 square kilometers. Tourists can walk around, go swimming and eat fresh seafood. Unlike some of the other islands, there is no military presence. 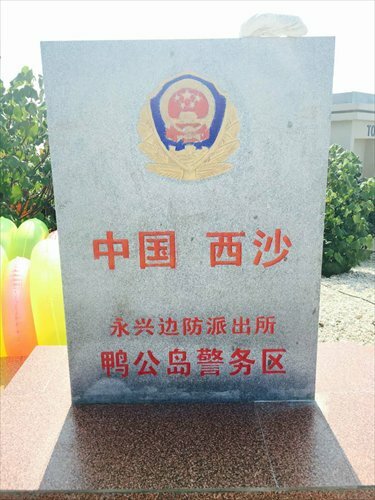 Right now, only people invited by the government or military can travel to Yongxing Island. In order to board the ship to Yongxing, one needs to have a Chinese ID, an official invitation and pay 200 yuan ($30) for the ticket. Even after they set off on their voyage, people face limitations. Yan said she didn't spend that much time on the islands or in the water. The group always acted as a whole. The "butlers" on the boats accompanied tourists at all times on the islands. A tourist told Southern Weekly he only had one hour of free time in the water, in an area the size of a basketball court. But the tourists said they had fun, nonetheless. People who travel on these voyages are well taken care of. "In the Chinese mainland, there's no service on any boat that can compare to ours," a butler on the Coconut-fragrance Princess who calls himself "devilfish," told Southern Weekly. On the boat, all butlers are referred to by the names of sea creatures and they each are responsible for eight to 10 tourists. "Devilfish" says that he never tells tourists what to do. "They'll choose for themselves. The islands and corals in the Xisha Islands are totally undeveloped and are 10 times more beautiful than the Maldives." "The sea was so unpolluted that it looked transparent, like bottled water," said Zhang Tianchen, a 23-year-old model who went on the islands for a photo shoot in March. She called the environment "primitive, unexploited," but says she likes it that way. Even though there's no five-star hotel, no developed water sports programs, the natural beauty itself was astounding, she said. Ever since the 1970s, there has been an article about the Xisha Islands in elementary school textbooks. The article began with description, "The Xisha Islands are located on the South China Sea. They are our country's frontline in coastal defense." Then it goes on to describe the color of the ocean, the corals, fish, and birds that reside on the islands, and ending with "the beautiful and rich Xisha islands, that's where our people lived for generations. As we build our country, the islands will become more beautiful." In recent years, there have been increasing official efforts to develop the islands. An administrative body for the islands, Sansha city was established in 2012, and tourism began in 2013. The topic of developing the Xisha Islands was repeatedly raised in the two sessions in 2014 and 2015. Last year, one of the seven focus points of work of Hainan provincial government was boat tourism to the Xisha Islands. Xiao Jie, the mayor of Sansha city and a national representative, told media during the two sessions in March that the air route to the Xisha Islands is scheduled to be finished within this year. "The airport terminals have been built and air control tasks completed. It's almost certain that Hainan Airlines will fly this route, and it's our dream to fly to the capital in our next step," he said. He also said the construction of piers on Qilian Yu and restoration of Beidao Island are now underway. Liu Feng, a Hainan-based expert on South China Sea studies, said facilities will be built on the islands for environmental protection and scientific research, while tourism and fishery resources in the region will be developed. Meanwhile, transportation between the islands is a priority plan. Piers and ferry boats may become the primary means to connect the islands. "By promoting tourism, infrastructure and fishery projects on the islands, China will have greater influence in the South China Sea," he said. 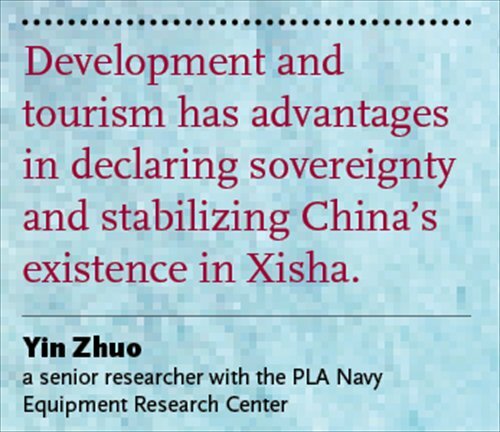 Yin Zhuo, a senior researcher with the PLA Navy Equipment Research Center, told China National Radio shortly after the boat route was decided in 2012 that "development and tourism has advantages in declaring sovereignty and stabilizing China's existence in Xisha." But the action seems to be stalling, or at least is not progressing as rapidly as some have hoped. Compared with China, Malaysia has more efficiently exploited the islands it occupies in the South China Sea, according to Southern Weekly. Since occupying Danwan Reef, Malaysia expanded it to three times its original size and named it Layang Layang. A tourist told Southern Weekly he could only find information using this name, not the Chinese name. When he called the service center, he found the receptionist could answer any question in English, Putonghua and Cantonese. After arriving on the island, he was welcomed with a cold drink and introduced to diving coaches. His room had a large window, fridge, TV, and air conditioner. The attendants even folded the hotel's towels into the shape of dolphins. He told Southern Weekly he felt "Maldives-style enthusiasm." Right now, Layang Layang not only has a naval base, but also an airport and fancy hotels. Li Jinming, professor at Center for Southeast Asian Studies at Xiamen University, told the Southern Weekly that the Vietnamese government has had success in attracting foreign investment. It authorized companies from India, the US and the UK to exploit oil and natural gas in reefs in the parts of the South China Sea that it claims. He thinks the Chinese government should also start drawing in investments, including grass-roots and foreign. But right now, there is an emphasis on preserving the area's ecology. When the people are on the islands, they are not allowed to leave trash or take anything away, not even a seashell. The boat butlers circle around the island after each trip and collect all the trash that tourists throw away. As a diver, Zhang said she hopes development can come slowly to these areas. She lives in Sanya and the seawater in that area is much worse than before. It used to be like Xisha's, but now the water stinks. But she agrees the islands should be advertised more and more people need to know about them. "I don't know why, but after my trip to Xisha, I've become much more patriotic," she said.